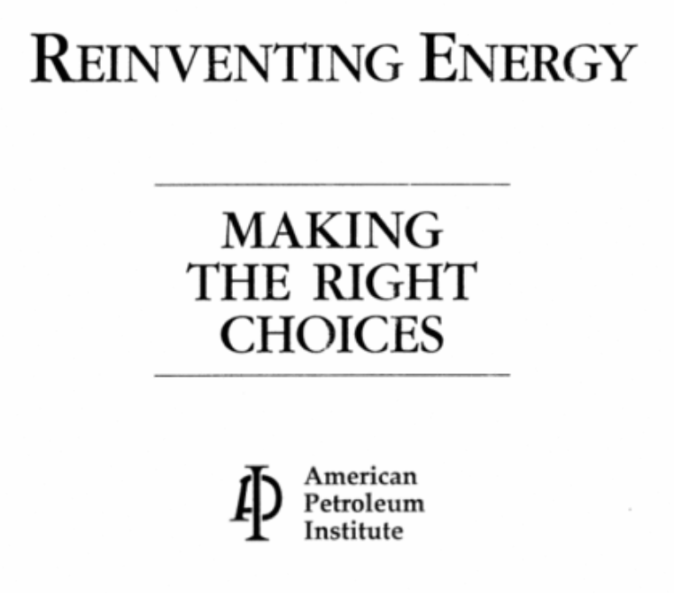 Responding to the public’s awareness of anthropogenic climate change, American Petroleum Institute’s (API) 1996 “Reinventing Energy: Making the Right Choices,” supported climate denial and argued for inaction. On behalf of its corporate membership comprised of oil majors, API’s interdepartmental team of economists, government affairs staffers, and “strategic communications” experts discussed public health and environmental safety while ardently defending their membership’s business models. Rife with contradictions, API’s Sally Brain Gentille, Russel Jones, Mary L. Tabor, and others maintained their positions on global security, alternative fuel use, and energy consumption by diminishing peer-reviewed scientific studies, distorting environmental impacts of fossil fuel combustion, and discounting the value of environmental law.